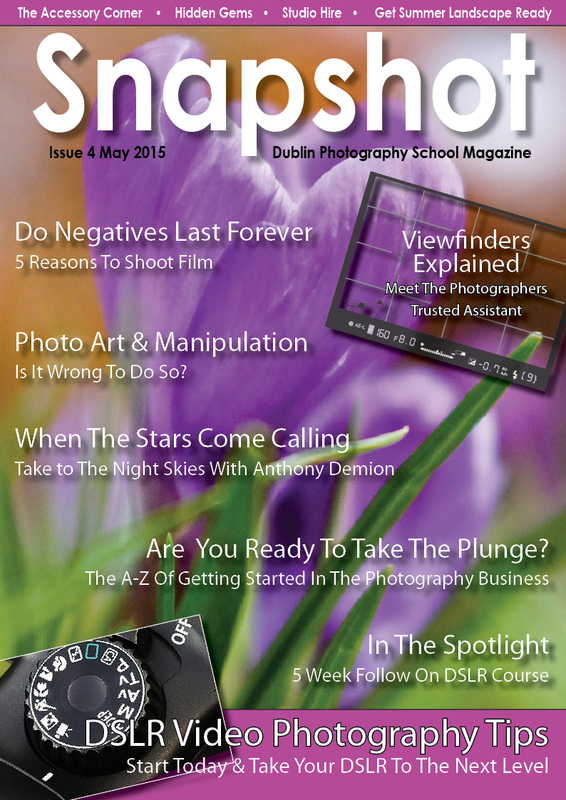 Snapshot Dublin Photography School Magazine Launched. “Snapshot” is an FREE online downloadable magazine produced by the staff and trainers at the Dublin Photography School. In each issue we will bring you guest articles from photographers around the country, we will showcase (over a eight page spread called “Through The Looking Glass”) submissions from our readers and we will let you know what’s going on in Dublin and around Ireland with photography events, seminars, competitions, exhibitions, talks and much more. We will discuss “what’s hot and what’s not” in the world of photography products, we will feature DSLR accessories and we will compare accessories as they go head to head. If you would like a chance to see your work displayed in the magazine or if you have an article for us that you feel would be of interest to our readers then drop us an email at info@dublinphotographyschool.ie. Please enjoy the read and thanks so much for joining. Snapshot magazine is a fully interactive PDF, which means all you need to do to visit a link is to click it. snapshot was designed to be viewed on iphones, ipads, tablets and android devices, in fact any portable device that supports a .pdf viewer, for more information or to download your free copy of snapshot Dublin photography school on line magazine click here. Please feel free to share with friends and family and no download restrictions apply.